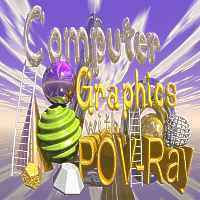 During the last years in a project course in the 13th class students created a great Computer Graphics Gallery # using the POV-Ray raytracing program. The images and animations shown here were made by students of class 11 with the raytracing program POV-Ray. The works of students of the Computer Graphics Workshop from 5th to 13th classes in 1996-2007 but also from short projects at the end of the school years are filling a big Gallery of creative images. 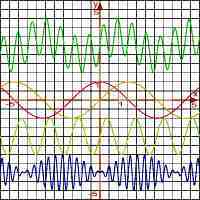 Not only for the 3D visualisation of geometic shapes in 3D geometry, of projections and conic sections, but also for a comfortable plotting of the curves of function graphs or for demonstrations of Analytical Geometry, POV-Ray can be used in math teaching. The Reconstuction of the school buildings of the KHS Gymnasium by Friedrich A. Lohmüller. www.povray.org - The Homepage of the freeware program POV-Ray with Download and Links. http://www.f-lohmueller.de/pov_tut/pov__eng.htm - Descriptions, Tutorials, Samples and a Insert Menu Add-on with Download by Friedrich A. Lohmüller. 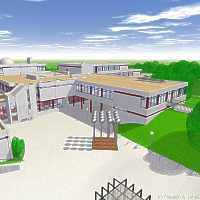 http://www.f-lohmueller.de/links/index_se.htm - Links to Schools, Highschools and Universities where POV-Ray is used.